Have you ever seen a trailer for a film and thought, “what did I just watch?” Or, “why is this clown fighting monsters on the subway?” Or even, “what is Michael Douglas doing here?” Welcome to “Animal World”, the bonkers new vision from Han Yan, the promotional trailers for which have been leaving viewers equal parts confused and excited. The film is based on the manga series “Ultimate Survivor Kaiji”. Zheng Kaisi works in a gaming arcade. Money is hard to come by and what little he earns, he spends after the hospitalisation of his comatose mother. He also has a “condition” where, whenever he feels overtly emotional, he imagines himself as Super Clown, his favourite childhood cartoon character, a sword-wielding crime-fighting vigilante wrecking havoc on the “monster humans.” His girlfriend Liu Qing is a nurse who lends him some money when she can and helps care for his mother at her hospital. When his childhood friend Li Jun comes to him with a real estate scheme that seems like it could make him a lot of money, he mortgages his mother’s apartment and hands over its deed to Li Jun. Inevitably, the deal goes south and Zheng Kaisi finds himself indebted to Anderson, a mysterious businessman who loans money to people without collateral at a very high interest rate. Anderson informs him that the only way he can erase his debt is by joining his game aboard the cruise ship Destiny. Zheng immediately agrees and is taken to the ship with many other debtors where they are inducted into the game. The rules of the game are simple: each player is given 12 cards- 4 Rocks, 4 Papers and 4 Scissors- and 3 stars. The players must play each other and the winner gets one star from the loser per game played. At the end of the allocated 4 hours, the players must have used up all 12 cards and must retain all 3 of their stars in order to be marked safe. What happens if they’re not safe? Well, you don’t want to know. 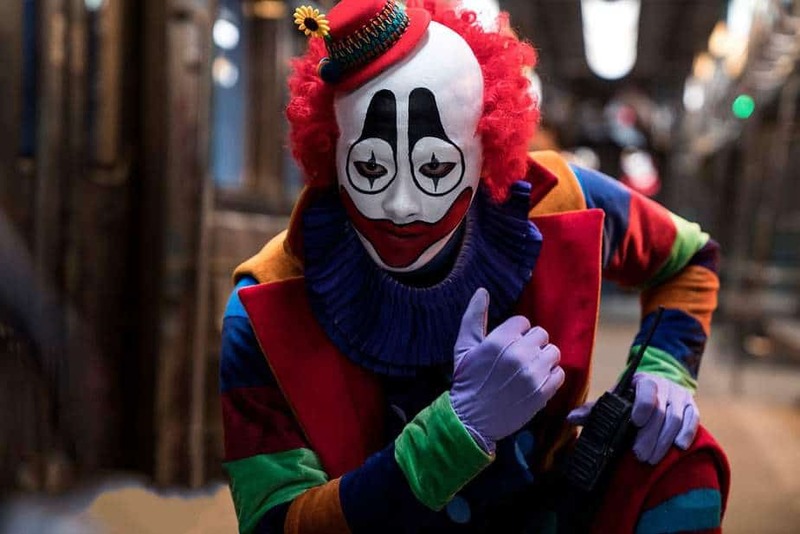 Clowns have been used in films often, mostly for their scary element, but director Han Yan is here to tell you that they can be absolute badasses too! it is safe to say that “Animal World” is, well, worlds away from his previous works, the Angelababy-starrer melodrama “First Time” and the cancer rom-com “Go Away, Mr. Tumor”. The film succeeds in preserving the kinetic action and the hyper-stylistic look of its source material manga. It begins with an off-the-chains action set-piece involving Super Clown and the aforementioned monsters inside a subway carriage and rarely gives up its pace since. However, one can’t help but think that the promotional trailers may have sold us a different film than what’s on offer here. The bits with Super Clown are spread too thin throughout the film and most of the film is taken up by the game on Destiny and the battle of wits waged to win it. Which is not to say that that part of the film doesn’t work or is boring; on the contrary, that is when the film is at its most interesting and exciting. Interestingly enough, the Super Clown parts of the story are not from the manga and are the only element that feel out of place in the story, particularly as Zheng’s “ablilites” as Super Clown never really come in handy in the narrative. But one can hope that could change and be explored further in the inevitable sequel, which is alluded to in the mid-credits scene. After all, there are three more gambling games apart from Rock, Paper, Scissors in the first series itself and five more over the course of six series of the manga. The motive for Anderson to having the debtors play this game are also hinted at, but never really mentioned clearly, and that’s something the sequel could improve upon, specially since the mid-credit scene gives us a little look into the pasts of the characters. While this is a film that doesn’t give the actors involved a lot of scope to show off their talent, Li Yifeng is earnest and believable as the charismatic Zheng Kaisi. Liu Qing doesn’t have a lot of screentime, but the adorable Zhou Dongyu leaves an impression. One could be forgiven for thinking that Michael Douglas may have been in this for the fat paycheck, but he has a lot of fun as Anderson and lights up the proceedings every time he’s on screen. Cao Bingkun is equally likeable as the loyal but irresponsible Li Jun. Though the logic and the card-counting behind Zheng’s actions through the game could possibly have been confusing to some, they’re easily explained via on-screen graphics that form a big part of the stylised look of the film. The CGI, by WETA and Rising Sun Pictures, is top-drawer! The monsters are familiar-looking but wonderfully realised. Together with Max Wang Da-Yung’s cinematography, the CGI gives the film a shiny, stylised neon look. Action scenes are briskly edited to give a kinetic feel to the proceedings. Neil Acree and Michael Tuller’s rock-based background score compliments the look of the film well. If there is one Chinese action film starring Michael Douglas and featuring a clown as a central character that you see this year, make it this one! “Animal World” is stylish, fast-paced, exciting and a hell of a lot of fun.